Dj switch will be FINALLY be dropping his ep titled #theSWITCHUP end of August 2014 with tracks still to come from him featuring CassperNyovest, Youngsta, Buffalo Soljah just to mention a few. Keep your ears and eyes locked onto #TheBiznizBlog for all the latest in Music and Entertainment as we keep you updated as things go down or Turn-UP. Sway Sandton & Barcadi presents: SHUT UP n PARTY! Insane line up that will keep you entertained the whole night! 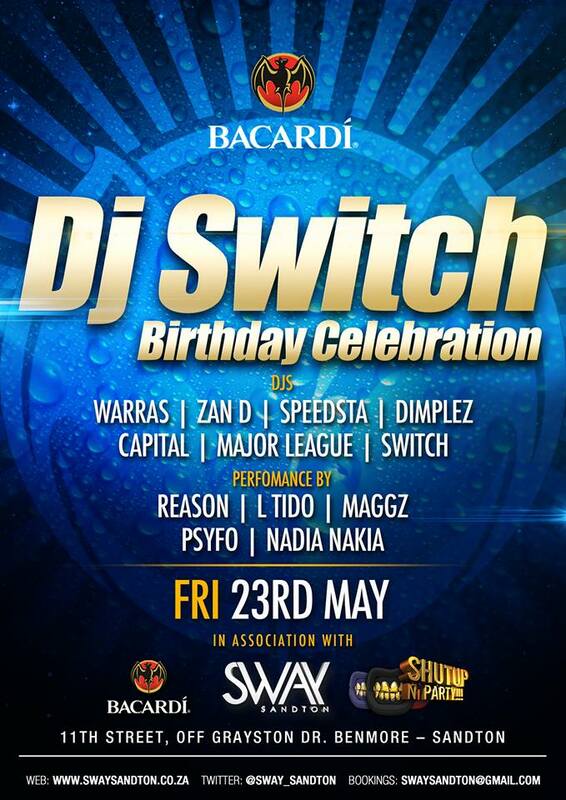 Follow Sway Sandton Urban & @DJSwitchSA for updates!